Android Chart Engine - aiCharts, is number one on Java charts market, designed and optimized for Android. It gives developer enormous advantage in compare to other Java charts engines which potentially can support Android. Native support of Android development environment, easy installation, complete set of tutorials and samples - all that makes integration with aiCharts simple whenever.Ability to arrange labels in column for pie chart. 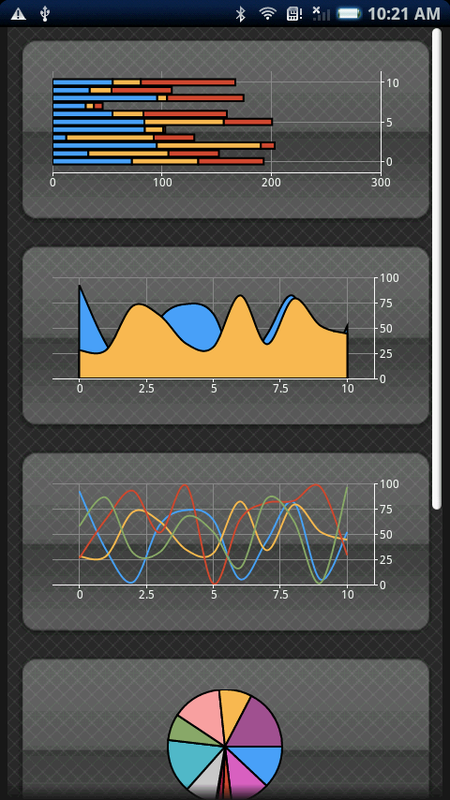 Android Chart Engine - aiCharts, designed and optimized for Android. ...... In few easy steps they can customize charts according to own application style. Modern visual representation of data gives freedom of creativeness and adds time for other important tasks. Great number of visual effects, transparency and custom drawing are supported. Qweas is providing links to Android Chart Engine 1.5 as a courtesy, and makes no representations regarding Android Chart Engine or any other applications or any information related thereto. Any questions, complaints or claims regarding this application Android Chart Engine 1.5 must be directed to the appropriate software vendor. You may click the publisher link of Android Chart Engine on the top of this page to get more details about the vendor.